Home Gift CardsReturn to Previous Page. 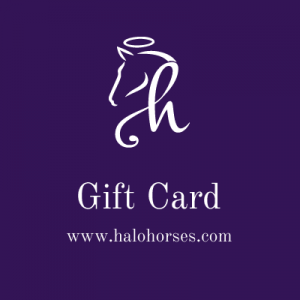 Give the gift of Halo Horses to friends and family for use online or in person. Choose your gift amount starting at $25. Give the gift of Halo Horses to friends and family for use online or in person. Upon purchasing the gift card, the person to whom you are giving the gift will receive an email with the details and a PDF for them to print out. If you would rather give the gift in person as a surprise, just make sure to enter your email address instead of theirs in the ‘Recipient Email’ box.